Ren is an engineer who maintains the 3D printers essential to the human colony that exists in the shadow of God’s City. Just how the colony started and what its aims were slowly unfolded in Ren’s stream of consciousness. Clues are revealed as to what happened as they arise in her mind, out of order and sometimes quite jumbled. The narrator has a lot to hide, from the other colonists and from herself. Then something unexpected happens: a stranger arrives claiming to be the grandson of the colony’s missing founder and Ren’s best friend, Lee Suh-Mi. She moves quickly to take control of the situation with Mack, the colony’s leader since Suh’s disappearance. What I like most about this book is that the story isn’t about the technology. It’s about the people, settled in a distant star system, keeping secrets. There is no apparent outside threat to the colony, no organized aliens, hostile or otherwise. God’s City is an alien monolith made of organic material that holds religious importance to the colonists. The greatest threat to the colony is the colonists themselves. Ren is rather reclusive, with severe social anxiety, and largely lives defensively, holding her fellow colonists with the exception of Mack at arm’s length. Newman focuses on these relationships, the different personalities of the colony’s movers and shakers, most of them accomplished specialists in their respective fields of study, telescoping back to the beginning of the colony two decades before. Advanced technology shapes these relationships–the 3D printers, neural and eye implants that allow the colonists to chat with one another, medical imaging that ensures good health–but it’s the human factor that remains important, how personalities conflict, how much anyone is able to remain private, a constant concern for Ren. Ren’s psychological condition is an integral part of the story. Everything that she experiences and recalls is filtered through her eyes. I don’t think the term “unreliable narrator” applies here; rather, she experiences everything that happens in the story in terms of what happened two decades before, when Suh disappeared. There’s a secret at the heart of Ren’s story, her reality, that becomes more apparent as the plot unfolds. Suh’s grandson Sung-Soo as an outsider realizes something is wrong with Ren, and he does everything he can to uncover what’s going on, as he explains, for Ren’s own good. Ren holds on to her secret and tries to keep the newcomer as far away from her as she holds the other colonists. I found this aspect of the story very compelling because of my own struggle with anxiety and depression. I felt that finally I had a character who thought and reasoned the way that I do, struggling with past scars and psychological wounds that had not yet healed. I love when authors narrate their own books. It adds another dimension to the story, allowing me to see how the author pronounces the characters’ names, how they play out important scenes. Newman is an excellent reader. The way she brought Ren to life added a lot to the emotional impact that the book had on me. I want to hear more of her voice work. I recommend Planetfall if you are interested in human colonization outside the solar system and how such a colony might operate in an ecologically sustainable way. Newman makes a good case for humans adapting to new environments rather than the other way around. I also recommend this novel to anyone who is suffering from anxiety and related mental conditions or who wants to better understand it. 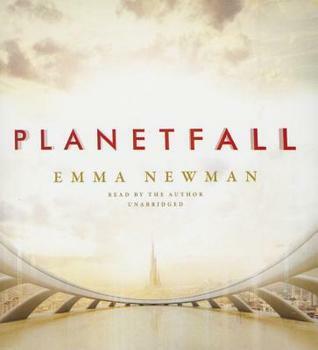 Emma Newman has written a compelling and highly satisfying story of human colonization in which the colonists–and the secrets they keep–are their own worst enemies. NOTE: I received a copy of this audiobook from the publisher via audiobookjukebox.com. My review has not been affected by this fact. I loved this too, and it sounds like the audio book worked really well. Although I’m trying to figure out what the audio book cover represents. It’s not at all how I pictured that world in my head.